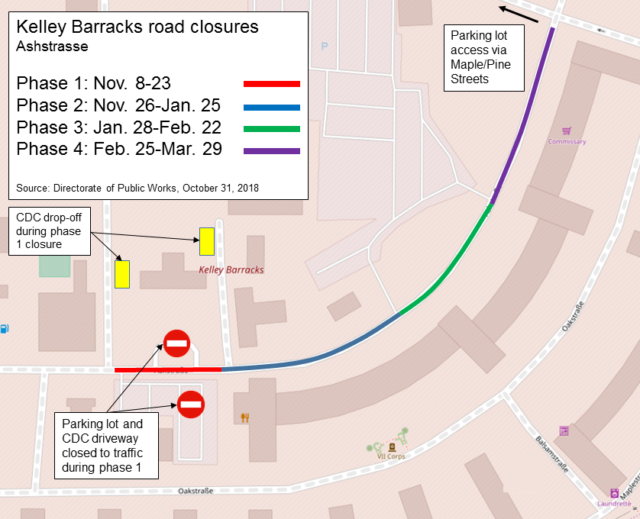 Road work on Kelley Barracks will result in several phased closures of Ashstrasse from November 2018 through Spring 2019. During Phase 1, the driveway of building 3352 (CDC) and the parking lot behind buildings 3362 (German Kantine) and 3353 (Subway) will not be accessible. Temporary drop-off areas for the CDC during this closure are to the sides of the building. NOTE: An earlier version of this article stated that phase 1 would begin on November 11. The most current date is November 8. 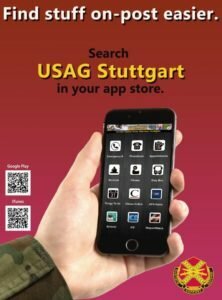 Note that access to the main parking lot of Kelley Barracks is always possible by taking Maple Street to Pine Street and continuing straight at the intersection of Ashstrasse.